A common problem for QDRO Attorneys is unclear judgment language that leaves to much room for interpretation by parties at odds with each other. This article will cover some of the more common mistakes that should be avoided. “Any and all of Petitioner’s retirement accounts, including but not limited to pension plans, profit sharing plans, IRAs, 401(k)s, deferred compensation, or other retirement accounts shall be divided by QDRO”. The problem with the unspecific “catch all” strategy is that it lacks specificity on what plans exist that should be divided. The job of a QDRO attorney is not to conduct discovery for the underlying case or to act as a ‘detective’ for the non-employee spouse. Discovery of retirement assets is the job of the family law attorney and by the time the judgment is entered, the retirement accounts should already be discovered or disclosed, so the exact plan names of all retirement assets are identified in the final judgment. If family law counsel has difficulty discovering retirement accounts, family law counsel should contact a QDRO attorney for advice before entry of final judgment. Family law counsel should also consider utilization of public information websites such as www.freeerisa.com or www.brightscope.com, which aggregate information on IRS 5500 forms, required by all ERISA plans. There is no cost to use either website and they both contain useful information regarding retirement assets such as names, addresses, and phone numbers of the plan administrators. Use of the QDRO attorney as your only ‘safety net’ to catch all the potential retirement accounts, is not a great strategy and should be avoided. The problem with the above format is twofold-it lacks direction on the inclusion or exclusion of gains/losses and it lacks specificity regarding a valuation date. On the market fluctuation (gains/losses) point, the question becomes: Is the $25,000 award supposed to adjust for market fluctuation of the underlying investments or not? 401(k)s and other defined contribution accounts are invested in stocks, bonds, mutual funds, and other investment vehicles that fluctuate daily with the rise and fall of the stock market. Is the intent that the $25,000 should be the exact amount down to the penny that should be leaving the retirement account at the date of transfer? OR was the intent that the $25,000 should ride the waves of market fluctuation? A QDRO attorney is not a judicial officer, and so the QDRO attorney should not be ‘ruling’ on this question. The second layer of complexity with the above language is the valuation date. Let’s assume for a moment the Parties have agreed the $25,000 should fluctuate with the market. That’s might be great progress for Parties who do not always get along, but now the question becomes: from what date should the gains/losses be tracked? From date of separation? From the judgment entry date? From the date the Parties calculated the ‘specific dollar’ award? Each date will cause a different mathematical result-which leads to problems when the date is not specified in the judgment. Unfortunately for the QDRO attorney trying to problem solve these situations, case law is not settled on this quandary. From the 4th Appellate District, 3rd Division, In Re Marriage of Heggie (2002) 99 Cal.App.4th 28, 120, Cal.Rptr.2d 272 discusses a ‘specific dollar’ award from Husband to Wife, to equalize the values of their respective IRA accounts. After entry of judgment, Husband’s IRA account sharply increases over a short period, while miscommunications between the Parties prevents the IRA funds transfer from finalizing. Attempting to ‘re-equalize’ at the higher values, Wife requests a set aside of the judgment. The Heggie Court found that a set aside request based on subsequent circumstances casing the division of assets and liabilities to become inequitable, was not sufficient grounds for set aside under Family Code 2123. The Court stated that Wife’s strategy of “wait-and-see, have-your-settlement-and-set-it-aside-too-if-stock-prices-go-up position” would be an unfair result. The Court ruled that Wife only could have her specific dollar award, without market appreciation. The Heggie ruling is contrasted with the 4th Appellate District, 2nd Division case, In Re Marriage of Janes (2017) 11 Cal. App. 5th 1043 (Cal. Ct. App. 2017), which also deals with a ‘specific dollar’ award. In Janes, Wife received a specific dollar award from Husband’s 401(k), and then a delay of over four years occurs before the QDRO is pursued. Similar to the facts of Heggie, in Janes the underlying account investments in Husband’s account increased in value over the 4 year passage of time, and Wife requested a share of those gains. The Court in Janes concluded Wife was entitled to a proportional share of the gains in the underlying investments. The Court pointed out that no valuation date was specified in the judgment for the specific dollar award, and no directions regarding inclusion/exclusion of gains and losses was specified. Due to the lack of direction in the judgment, the Court concluded Wife’s ‘specific dollar interest’ was vested as of date of the judgment (the valuation date), and Wife’s investments fluctuated with the market inside Husband’s account (gains and losses were included). The Janes Court directs that absent a specific valuation date and instructions on gains/losses, the valuation date shall be the date of entry of judgment and gains/losses will be included from the date of judgment to the date of account division. Since the Janes and the Heggie cases are out of different Appellate divisions, they are both good law. It seems the distinguishing factor between the two cases is the passage of time between the judgment date and the account division date. To avoid an unnecessary analysis of the Janes and Heggie cases in a Court hearing, counsel should specify inclusion/exclusion of gains and losses and a valuation date for any ‘specific dollar’ award in the judgment. This language may not cause a problem in all cases. Where there is no pre-marital separate property interest to be considered, half of the total vested account balance as of date of separation IS ONE AND THE SAME as half of the total community property interest-since 100% of the total account balance as of date of separation is also 100% community property. 50% of the total vested account balance is equal to 50% of the community property portion. However, this language becomes problematic when there is a pre-marital separate property claim. It seems the door is open for the non-employee spouse to argue that the account owner ‘waived’ his/her pre-marital separate property interest. The judgment language states the 401(k) account shall be split ‘in half’ between the Parties…how many ways can the word “half” be interpreted, really? In a dispute between the Parties…at least two ways…the account holder argues the word “half” means half of the community interest, and the non-account holder argues “half” means half of the total underlying account value…either interpretation is not unreasonable…and that’s the problem. The best way to avoid a debate over the meaning of the word “half” is to properly define the division method. If the Parties intend that half of the total vested account value be split, then the phrase “half the total vested account value” is clear. If half of the community interest is intended, then using the phrase “half of the community interest” is clear. By keeping these easy fixes in mind, many headaches can be avoided at the QDRO stage. Please do not ask the QDRO attorney to ‘paid off’ the 401(k) loan via QDRO-that is not an available option to the QDRO attorney. Loans can only be ‘paid off’ with outside funds not part of the underlying account. The core of the confusion on the ‘payback of loans’ is the QDRO attorney must think in terms of ‘including the loan’ (mathematically adding the loan value back in as an asset of the 401(k) before division) vs ‘excluding the loan’ (not adding the loan value back in as an asset of the 401(k) before division). This does not translate with “the loan should or should not be paid back” by the non-employee spouse. The concept often lost with Parties/Attorneys is that loans against retirement accounts differ from loans against credit cards or other 3rd party obligations. Loans against defined contribution accounts are BOTH an obligation AND an asset to the employee spouse. The reason is that the loan payments are due FROM the employee spouse (obligation) and TO the employee spouse’s account (receivable/asset). The employee spouse is both the ‘bank’ loaning the money and the ‘debtor’ borrowing the money. Because of this dual characteristic, 401(k) loans differ from 3rd party loans-where the 3rd party retains the repaid principal and interest. With 401(k) loan, each payment increases the underlying value of employee’s 401(k) account and reduces the outstanding balance of the loan. The employee retains the repaid principal and interest. The best advice for handling loans in a judgment, is to describe how the loans are classified-are they community or separate property loans? If the QDRO attorney knows the loan is a community or separate property-then no matter when the loans are taken out (before or after date of separation), the QDRO attorney can properly account for handling the loan following community property principles. The above language has a conflict in it-can you spot it? This language suggests two methodologies for splitting the underlying account. The first part the instructions appear to intend a standard community split. However, the second half of the QDRO instructions appear to define the 50-50 split value as $100,000, implying each party should receive $50,000. Well…what is it? A 50-50 split of the community? Or $50,000 to each party as of judgment entry date? Is the $100,000 a ‘for your information only’ fact? Or is the $100,000 what the Parties agreed community value is for purposes of the QDRO? If contributions or withdrawals were made between the separation date and date of judgment, then the mathematical result of a ‘community split’ vs a $50,000 award to each party would be different. Many family law attorneys believe they are being helpful by adding additional details-such as in the above example. Another common mistake is always adding in language for the ‘time rule’ formula, no matter what type of retirement account is being divided. The time rule formula is more commonly used for division of a pension plan (and it is not appropriate for all pension plans) and should rarely be utilized for division of a 401(k). Unless the family law attorney is intimately familiar with the differences between various retirement accounts and how they function, additional mechanical instructions on how the community interest shall be calculated, can be very confusing to the Parties and the QDRO Attorney. SO WHAT LANGUAGE DOES WORK? The community property interest in Petitioner’ ABC and XYZ retirement accounts and the community interest in any survivor benefits in the accounts will be equally split between the parties via QDRO/DRO. For purposes of the QDRO/DRO the parties’ date of marriage is [DOM] and the parties’ date of separation is [DOS]. [Favorite QDRO Attorney] will be the Evidence Code 730 Expert for the division order(s) and the parties will retain QDRO Attorney’s services within 30 days of entry of judgment. QDRO Attorney’s fees will be split equally between the parties. 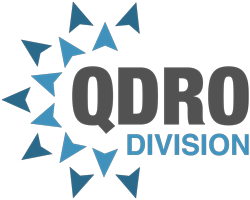 Both parties will cooperate with QDRO Attorney’s requests for records to complete said divisions, including any records that may be needed for separate property tracing analysis. This language is ideal for several reasons. (1). This language can be used for any plan (other than military) where the desired outcome is a community split-Defined Benefit/Defined Contribution/Union/NonUnion/State/Federal/ect. Unless the Parties want to deviate from a standard community split-there is really no reason to go into extreme detail regarding how the plan will be divided or change the marital settlement agreement language depending on what type of account is being split. ‘Equal split of the community’ means the QDRO attorney follows established California community property law to divide the account and any potential disputes between the parties can be resolved by pointing to established codes/case law. This way of problem solving is much easier than trying to piece together what was or wasn’t said in settlement negotiations, when the judgment language is ambiguous, and parties are questioning the drafting of the QDRO. (2). This language includes an award of the community property interest in survivor benefits (which under Family Code 2610, the non-employee spouse is entitled to as a matter of right.) This can be important where an untimely death occurs, and that language becomes critical to preserve jurisdiction to prepare a ‘post death QDRO’. When a remarriage occurs, this language is critical to preserve a former spouse’s survivor rights. Absent this language, the new spouse’s survivor rights would supersede the former spouse’s rights. This hypothetical horrible became a reality for one such former spouse in the case of In re Marriage of Padgett (2009) 172 CA4th 830, where the judgment ‘reserved’ over the retirement benefits and no mention was made regarding survivor benefits. (3). This language includes a provision that the parties will provide any records requested by the QDRO attorney-which is critical in high conflict cases where one party simply refuses to provide necessary documents because ‘the judgment does not order it’. Another great place to lift language is from the rarely used Judicial Counsel Form FL-348. Or better yet, attorneys and parties may want to use FL-348 as a standard attachment to their marital settlement agreements. Be a leader and start a new trend! FL-348 is an excellent form and avoids all the unnecessary errors discussed in this this article.